I have made a concerted effort to get away from reading logs in my classroom. I know, I know. So many people use them and love them, but honestly, I just didn't. Years ago, I did get away from the "mom sign this" reading log by creating a more content based log (that I still use as in class assignments) but that just wasn't working for my students anymore. Tracking them down on a daily basis to see if they did their reading wasn't creating readers and it wasn't making me very happy as a teacher. I created my Reading Bookshelf (that I LOVE LOVE LOVE, and highly recommend to all of you...not that I am biased or anything.) but I found that I just wanted a little bit more formal information from the kids. So this year, I played around with Google Forms, and came up with something that I am really happy with. Since it was working so well, I thought I would share with you. 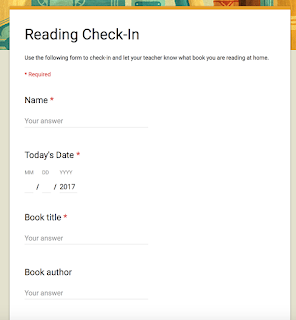 The first thing I did was create a very simple Google Form to capture the basic reading information. I didn't want to overwhelm the kids and really, all I want to know is that they *are* reading and the types of books they like. So my form included the book title, author, genre, and a one sentence summary. You can access my form here to copy and use in your classroom. As you probably know, if you assign this form to your students at one time by just giving them the same link, all of their responses will go to one spreadsheet. Now, that is fine if you are going to do this once. I, however, wanted this link to be something the kids would be using 2 to 3 times a week so I had an ongoing record of their reading. If the responses were on one spreadsheet, I would never be able to sort them. Instead I wanted the forms to generate responses to different sheets that, if I clicked on, would be an ongoing record of the books, as shown below. Above are two different reading records for two different students. 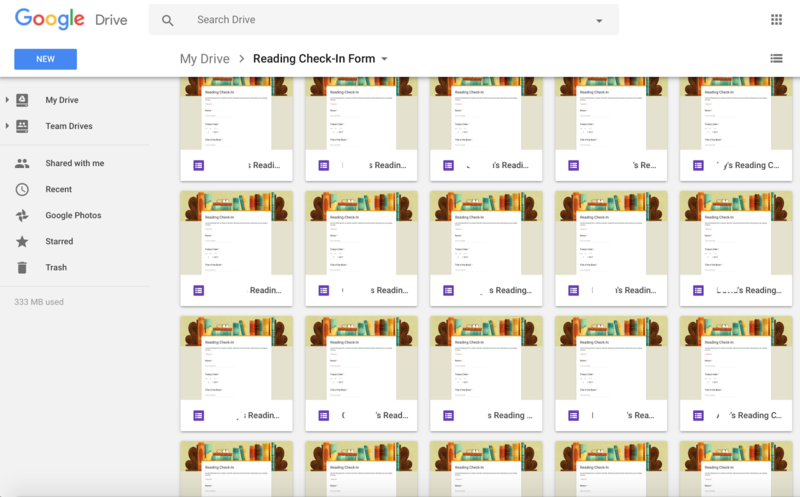 Every time they log onto their Google Form, a new line generates on their reading record with a new set of information. I had to make a copy of that original form for EACH student in my class. I created a new folder on my drive to house all of the forms in so they weren't cluttering up the entire drive, and named each form with the student's name. I blotted out the names on the picture, but you get the idea. 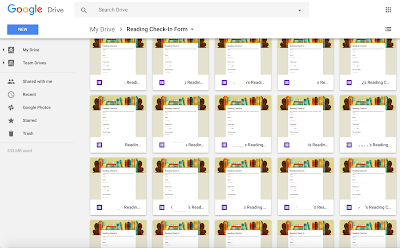 Then, on Google Classroom, I assigned the forms ONE BY ONE to each student. Since GC has that great feature where you can assign something to individual students, this wasn't super hard. It was time consuming though, and it got a bit repetitive. Just make sure you are organized. I had a list of all my students next to me and was checking them off as I assigned the form. Now, as you probably know, all of these forms will get their own spreadsheet to record the information being input. I didn't want that either. I wanted the forms to be linked. Here's how I did that. 1. 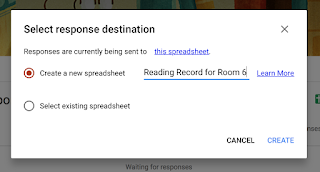 When I went to create the spreadsheet for student #1, I named the spreadsheet "Reading Record for Room 6". 2. For student #2, instead of generating a new spreadsheet, I LINKED it to an existing spreadsheet. When I clicked on "Select response destination" , it took me to "Select existing spreadsheet." Once I click on that, my drive comes up. 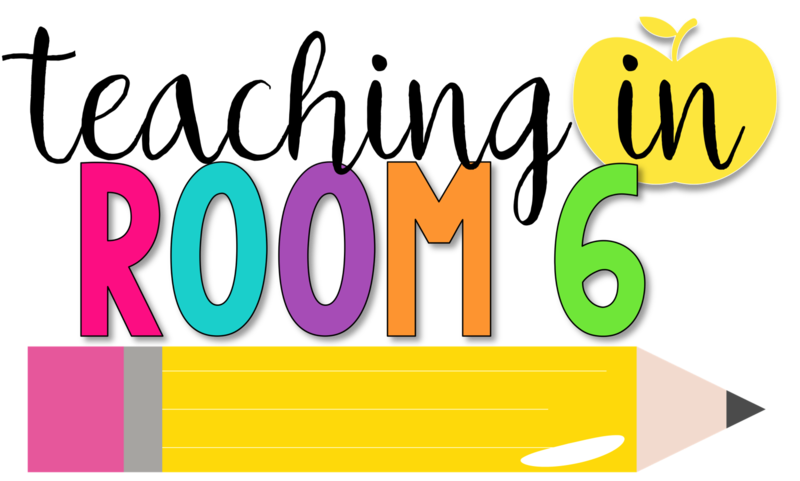 The Sheet "Reading Record for Room 6" will be near the top and you can click that one. Then, once you have select this section, your drive will come up. Choose the "Reading Record for Room 6" spreadsheet every time. That will create a new tab on the spreadsheet. 3. The tabs will be generated and named "Form Response". Right click and you can choose to rename it. I renamed the tabs to match the student #, but you can add the student names there if you wish. 4. I repeated this over and over for all 33 of my students. I did make myself a reading log to link as well, so that I could try it all out (as you really should try out the sheets to make sure they link properly before you disseminate them to your students.) 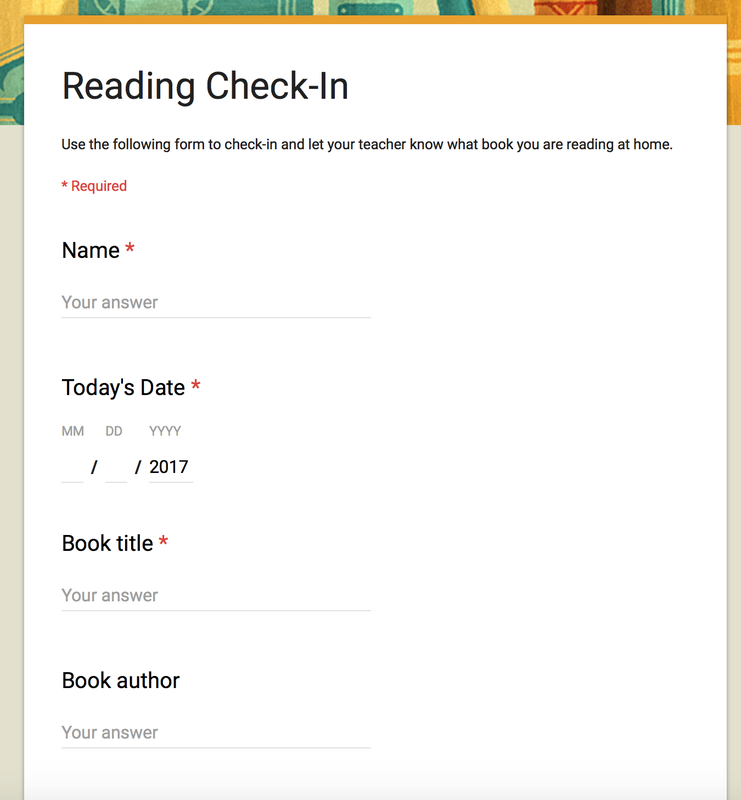 But now, every time I want my kids to submit a reading check in, they just go to their GC feed and click on that same form. So there you have it. A way to keep the kids reading records in one place, organized, and easily accessible. I have my students do this 2-3 times per week (or when I remember, if I am to be really honest.) It takes them about 3 minutes to fill in the form and gives me a glimpse into what they are reading. 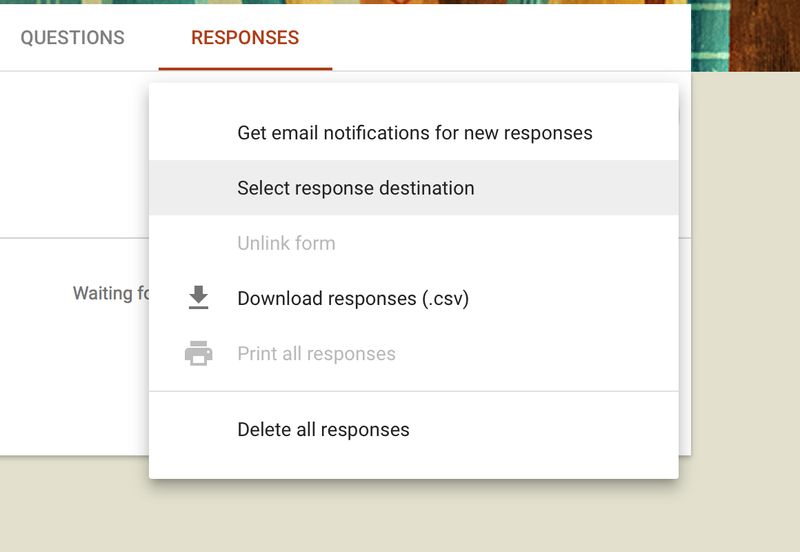 Have you used Google Forms in this way? What questions do you have for me about the reading record? I am sure that there is an easier way, as I am just diving into all of this on a trial and error basis. Right now, this is what worked, but maybe someone else can chime in with something more efficient? It did take a while to set this up initially, but I can tell you, it has paid off big time in the end. Google Classroom is ALWAYS changing features, adding things, changing things, etc. There is a feature at the bottom of the screens (usually) where you can offer feedback. If enough teachers want something changed or to be made easier for them, they usually will do it! We are not one to one either. I just have them do it when we get the devices. But you could also just have it set up as a station with the devices you do have and have the kids log in and out. Honestly, it takes them 3 minutes (as fifth graders) to log on and fill out the form. The more they do it, the less time it takes. So having 3rd graders do it a few at a time could be an option. They wouldn't all be able to log on during the same school day, but that is ok.
We use reading logs with signature as a part of homework. This week, w are going to go away from weekly packets and only have reading logs count as homework. I love the idea of the form, I actually tried it last year. Your ideas look a lot better than mine though. What are your suggestions for how to make this applicable for a homework grade? Thanks! Logs a few years ago. It was freeing! I think you can actually sort the spreadsheet by student. That would be easier than creating 135 (or even 33) separate forms and spreadsheets. The problem I was having with doing it that way was that it was still on only one spreadsheet. Even when sorted, by student it showed them all on there and it was too much of a visual jumble. Having them all on a separate spreadsheet, that is connected together by the tabs, is so much more visually appealing to me and easier for me to gather the information I need from it. I am coaching a 7th & 8th grade Social Studies teacher on a requested use of Google Forms. I might be able to use the 'select existing spreadsheet' setting for part of the solution from your post. However, there is still a dilemma with the Form. Let me explain - the teacher uses Forms for his daily bell ringer. His request is to gather a cumulative grade at the end of the week. I created a demo Form with sections (one for each day of the week) set to submit after each section. The problem is advancing the Form past the Monday section to see Tuesday's bell ringer section the next day, Wednesday's on Wednesday, etc. I may be asking for an impossible feature, but if someone knows how, please advise. Thank you!!!!! Oh my gosh, thank you from the bottom of my heart. I have been using one form for everybody, and I've wondered how I can organize it better. You answered it and gave such amazing, thorough directions! I already have it ALL set up for my students tomorrow, and I am beyond excited! 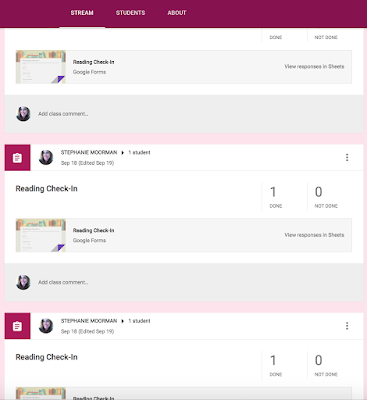 One more thing that I did was when I set it as an assignment to my students, I added a Topic in Google Classroom and named the topic, "Reading Check-In". I can click on that topic and all of them will be in my feed at one time. The topics are great because it can organize them better, if you want to narrow down the traffic on your assignment feed. I love this idea. I have been using a reading log, but am not happy with it since. This seems much less of a hassle. I already set up my forms and spreadsheet. Now I just have to assign to my students via Google Classroom. Okay super silly question, but how do you create the spreadsheet?! Love this idea. I have been messing around with it too. I love using google forms to create surveys and info. One tip to help without having to do individual for each student... just send out one link to all then use the FREE google add-on call "row call" and it will automatically sort each student into a new sheet for you off the same responses. Added bonus you can set it up to automatically update to the separate sheets. *I use row call for my homework log for students to track missing assignments after they scan a QR code. 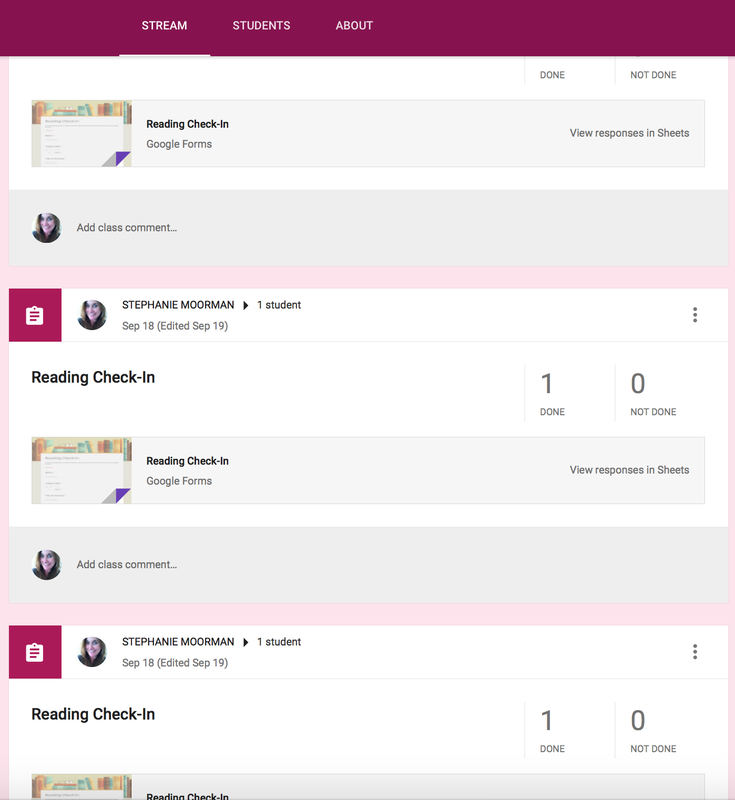 "I did make myself a reading log to link as well, so that I could try it all out (as you really should try out the sheets to make sure they link properly before you disseminate them to your students.) But now, every time I want my kids to submit a reading check in, they just go to their GC feed and click on that same form." How am I able to do the following you stated above? How am I able to see the assignment and try it out myself? 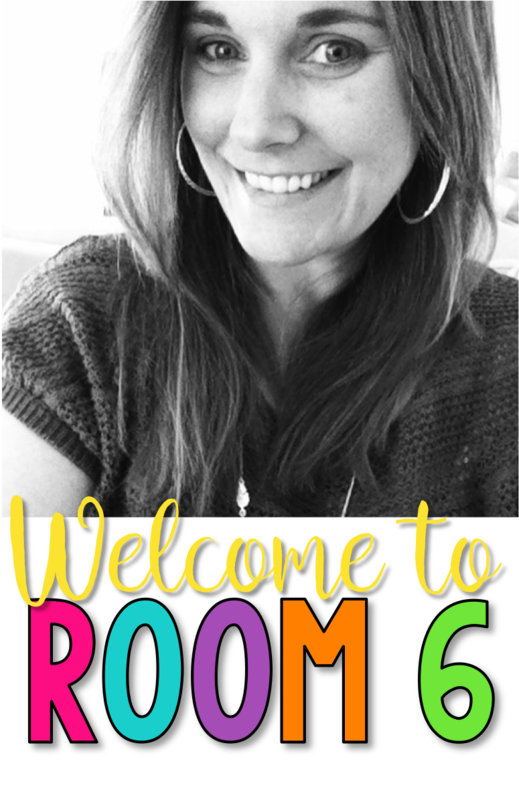 I'm new to google classroom. 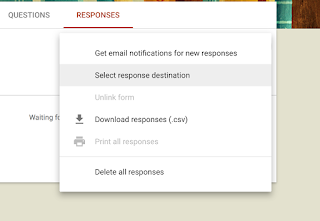 How do you link your Google Form to the Google Classroom Assignment? Just as a link? Yes. Just a link on Google Classroom. When you say say they just have to click on the link to submit info after the initial entry, do you mean they just open the assignment and fill out the Google Form again, or is there a link they have to use? They just go back to the same assignment. After a year of putting this off, I finally finished setting mine up! Question: Why ask the students to indicate the date, if Forms and Sheets time-stamps it anyway? Thank you so much! This will help me have the children stick to reading goals.